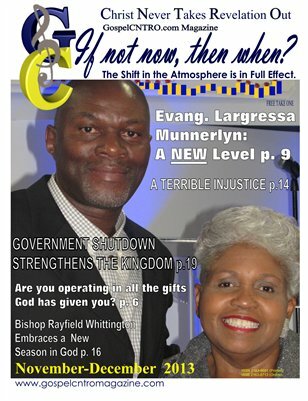 The results of the shifting in the atmosphere is the focus of this bi-monthly issue of GospelCNTRO Magazine. We interview a Colorado great in the area of gospel, Evangelist Largressa Munnerlyn. Featuring a creative writing presentation of our theme "If not now then when," by Kristy Penson. The Death Penalty is said to be the new avenue of slavery in the 21st Century, Superintendent Patrick L. Demmer discusses the situation in this issue. The atmosphere is shifting for us to grow stronger in our spiritual discernment and giftings to edify the Kingdom.